As originally posted on Horse Crossings. After I wrote and self-published my first novel Flying Changes in 2011, I started work on the sequel right away. Partly because I wanted to, and partly because I was told to. Don’t stop! everyone said. Keep the momentum going. Don’t be a one hit wonder. Small chance of that. Everything I write is part of a series. I can’t seem to do it any other way, even when I want to. There was just one problem. I didn’t know what happened in book 2. Other than the fact that it was called Against the Clock, it was a blank slate, a page without any words. Looking back, no wonder it was hard to write. Just skip it, suggested my mother. Move on to the story of book 3. Make it a trilogy instead. Not terrible advice, except that there was no way I could do that. For the events of book 3 to have emotional resonance, there needed to be time and character development from book 1. I needed Jay, my protagonist, to grow up a little bit more before I could throw her into the dramatic events of book 3. But I was struggling. I looked over the first draft and knew that it wasn’t great. The story leapt all over the place, characters turned up for a few chapters then vanished without any resolution to their part of the story, and the whole plot just meandered along vaguely. Eventually, I was so disparaged that I couldn’t even look at it, so I decided to write something that would just flow. Something that I had no stakes in or expectations of, just pick a scene in my head and start writing, and see where the storyline would go. I clearly recall sitting in my bedroom in Ireland, visualising that house’s cluttered front hallway, and starting to write. She ran down the hall, bare feet slapping against the dusty floorboards. I kept writing, intrigued, as my new heroine ran into the kitchen to find her big sister sitting at the kitchen table, surrounded by overdue accounts. It was supposed to be one scene, a writing exercise full of action that would break me free of the net that I was trapped in. It wasn’t supposed to turn into a book, but those characters moved into my head and took over. A year and a half later, I had completed a novel called Dare to Dream. I released it into the world, and went back to working on Against the Clock. Armed with more skills and experience and the newfound realisation that even pony books can’t be all about ponies all of the time, I started hacking storylines and characters out of the first draft. But then the story just lay there, apathetic and dull and uninspiring. I fumbled around for ideas, and found a few. I added them to the story, watched them settle in and become part of the fabric of that world. They worked, but they were small character moments, not big plot moments. And the plot itself was still feeble. It still didn’t work. Meanwhile, Dare to Dream was gaining traction. It sold well, and consistently. It got five-star reviews. Readers loved these characters, loved this storyline, and wanted more. And the characters themselves wouldn’t go away either. They wanted their story to be continued. I knew what happened after the events of Dare to Dream, but nobody else did. I wrote the epilogue to the sequel, and it made me cry. So I decided that everyone else should get to read it too. I put Against the Clock aside once more, and started writing Dream On. Just under a year later, Dream On was released to rave reviews, and I went back once more to Against the Clock. This time I was going to make it work. Armed with yet more knowledge and writing ability, I stripped the story right back to its bare bones, then slowly pasted the character moments back in around the plot. Slowly, slowly, it started to form into a proper novel. It fell into place, just needing me to write some additional scenes and trim back or rewrite a few existing ones. It was almost ready. There was only one problem – I was really struggling to let go of Dream On. I don’t usually like reading my own work, but I kept going back and re-reading that book, just so that I could live in that world a little longer. I couldn’t help it. I didn’t want to go back to Clearwater Bay and deal with Jay’s smaller, more trivial problems. I didn’t want to go back into first person and not be able to explore different viewpoints, or jump to another character to keep the pace going. And I love the girls in Dare to Dream and its sequel. They’re the kind of people I’d be friends with (are in fact loosely-based on actual friends of mine) and I was still missing them. They’re sisters, with a strong sisterly bond, and I felt as though they were part of my family. It was really hard to walk away, but I made myself do it. I made myself step back into Jay’s life and take her hand and guide her along the path towards book 3. And eventually she stopped snatching her hand away from me and telling me that her story was stupid and boring and I shouldn’t really bother, and we started working together. And when it got hard and stagnant and I wondered why I was bothering, the voice of one of Jay’s good friends in the book came into my head, as it does hers when things get tough in the narrative. We both took his advice. Against the Clock is done now. It got auto-delivered to the lovely people who have pre-ordered it on April 19th, and I can sit back and cross my fingers and hope that people enjoy it as much as my beta-readers (fortunately) did. So far, so good. And so, on to book 3 in the series. I’m looking forward to this one, although it’s going to require a lot of research and a hefty dose of imagination. There are some dark moments in this book, and while I can’t wait to explore them, it’s going to take some work to get myself into the heads of these characters. Because the thing with writing a series in first person is that there are only so many things that can happen to and directly affect one character. For Jay, her journey is as much about learning from other people as it is about herself. It’s about learning to recognise other people’s problems, and understand their opinions, and expand her own view of the world through the framework of how others also perceive it, and how she perceives other people. I’m excited to explore that, and I can’t wait to get to the end. I’m on a roll now, and Jay has decided that yes, she does want her story told. It also helps that the next two books will involve more outside characters, and less internal monologuing. And in those moments that still creep in, when I’m feeling particularly dispirited and wondering if I can be bothered writing these books, I re-read the last chapter of book 4, and I know that it will all be worth it when I get there. 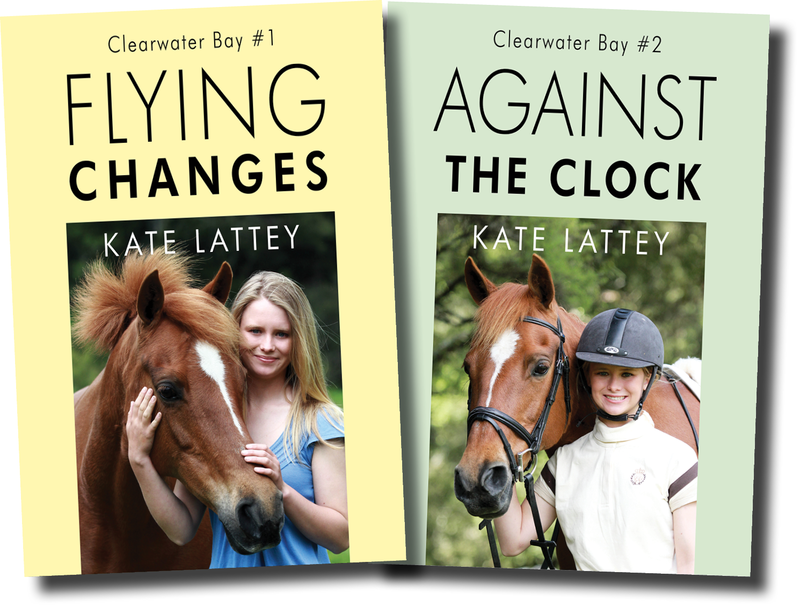 You can read First Fence, the first book in the Pony Jumpers series, for free on Wattpad (http://www.wattpad.com/story/35897826-first-fence-pony-jumpers-1) and it will soon be available on Kindle as well, with a sneak preview of the upcoming sequel at the back. I hope to have the sequel out by the end of this month (the first two chapters are up on Wattpad, but the whole book will only be available on Kindle), and the third book in the series out by late May. As for book 3 in Jay’s story, I’ve already got some scenes written. In fact, I wrote one last night, and it’s included at the end of Against the Clock to whet readers’ appetites for what’s to come. I’m excited to get going on it, because I’ve been wanting to write about these characters and tell this story for years. And now I feel as though I’m ready. It’s their time.